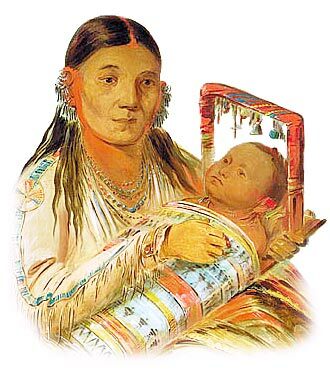 This article contains facts and information about different aspects of the daily life, history and lifestyle of Native American Indians including info about the Native American Paint. Discover how the men, women and children lived and worked in Native Indian villages and how they spent their leisure time. This article about Native American Paint brings the Native American lifestyle literally to life, enabling a better understanding of the subject. How was Native American Paint made? The Indians made paint from the natural resources that were available to them in order to make different colored dyes and pigments. Native American Paint, in it's simplest form, consists of a ground up pigment suspended in some sort of liquid, or binder such as urine, spit, egg yolks, animal fat or even blood. Native American Indians prepared the paint which was then dried and stored as a powder. Red Paint was made using red clays (which contained oxides of iron), roots, berries, barks and beets. For additional facts and info about paint colors see the article on Color Meanings Symbolism. Native American Indians was applied with the fingers, animal bones, sticks or grasses. Plains Indians used a spongy bone from the knee joint of the buffalo which held paint just as the modern fountain pen holds ink. When applying war paint the Indians first smeared their bodies with buffalo or deer fat and then rubbed on the paint. Native American Paint. Discover the vast selection of pictures which relate to the History and Life of Native Americans. The pictures show the clothing, war paint and every day elements of various Native Indian tribes. A really useful educational history resource for kids and children of all ages on the lives and lifestyle of Indians. We have included pictures and videos to accompany the main topic of this section - Native American Paint. The videos enable fast access to the images, paintings and pictures together with information and many historical facts. All of the articles and pages can be accessed via the Native Indian Tribes Index - a great educational resource for kids.